Referred to as “the most famous astronaut since Neil Armstrong,” Colonel Chris Hadfield is a worldwide sensation whose video of David Bowie’s “Space Oddity” — seen by over 75 million people — was called “possibly the most poignant version of the song ever created”, by Bowie himself. Acclaimed for making outer space accessible to millions, and for infusing a sense of wonder into our collective consciousness not felt since humanity first walked on the Moon, Colonel Hadfield continues to bring the marvels of science and space travel to everyone he encounters. In 1992, Colonel Hadfield was selected as a NASA Mission Specialist, and three years later he was aboard the Shuttle Atlantis, where he helped build the Mir space station. In 2001, on Shuttle Endeavour, Colonel Hadfield performed two spacewalks and in 2013, he became Commander of the International Space Station for six months off planet. 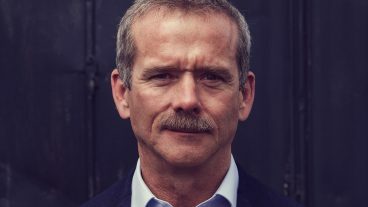 Currently, Colonel Hadfield can be seen as the co-creator and host of the internationally acclaimed BBC series Astronauts: Do You Have What It Takes?, and he is co-hosting, with actor Will Smith, the National Geographic series One Strange Rock, directed by Darren Aronofsky. “Good morning, Earth!” (“Bonjour la Terre!”) C’est ainsi que le colonel Chris Hadfield débutait chaque matin ses sessions sur Twitter pendant son séjour de cinq mois à bord de la Station spatiale internationale. Au terme d’une carrière d’astronaute ayant duré 21 ans, au cours de laquelle il a participé à trois vols dans l’espace, le colonel Hadfield est devenu une célébrité mondiale en canalisant le pouvoir des médias sociaux pour rendre l’espace accessible à tous, en y réinjectant au passage un sens de l’émerveillement qui n’avait pas été ressenti par les citoyens de la Terre depuis les premiers pas de l’Homme sur la Lune. Maintenant considéré comme l’astronaute le plus connu depuis Neil Armstrong, Chris Hadfield continue de promouvoir les merveilles de la science et de l’espace auprès de tous ceux qu’il rencontre. Le colonel Hadfield a inscrit plusieurs premières au palmarès de l’histoire du Canada dans l’espace. En 1992, il a été sélectionné par l’Agence spatiale canadienne pour entreprendre un entraînement de spécialiste de mission de la NASA – devenant à ce titre le premier astronaute canadien entièrement qualifié pour opérer les systèmes de la navette spatiale. Trois ans plus tard, à bord de la navette Atlantis, Hadfield a été le premier Canadien à opérer le Bras canadien dans l’espace, ainsi que le premier Canadien à visiter un vaisseau spatial russe alors qu’il contribuait à la construction de la station spatiale Mir. En 2001, à bord de la navette Endeavour, le colonel Hadfield est devenu le premier Canadien à marcher dans l’espace alors qu’il effectuait deux sorties extravéhiculaires pour installer le Canadarm2 sur la station spatiale. En 2013, il devenait le commandant de la Station spatiale internationale – à ce jour, le premier et seul Canadien à prendre le commandement d’un vaisseau spatial habité. Au cours d’une carrière présentant de multiples facettes, le colonel Hadfield a, entre autres, intercepté des bombardiers soviétiques au-dessus de l’espace aérien du Canada, vécu au fond de l’océan, agi en tant que Directeur des opérations de la NASA en Russie, et enregistré des vidéos à caractère scientifique et musical qui ont été visionnées par des centaines de millions d’internautes. Décoré de nombreuses fois à titre d’astronaute, d’ingénieur et de pilote, le colonel Hadfield s’est vu décerné plusieurs médailles, parmi lesquelles celle de l’Ordre du Canada, celle de l’Ordre de l’Ontario, la Meritorious Service Cross, et la NASA Exceptional Service Medal. Il a été nommé meilleur pilote d’essai (Top Test Pilot) à la fois par la US Air Force et par la US Navy, et il a été intronisé au Temple de la renommée de l’Aviation du Canada. Auteur du bestseller international Guide d’un astronaute pour la vie sur Terre, Chris Hadfield a été commémoré sur des timbres émis par Postes Canada, sur des pièces d’or et d’argent frappées par la Monnaie royale canadienne, ainsi que sur le nouveau billet de banque canadien de cinq dollars (qui célèbre également ses collègues astronautes Steve MacLean et Dave Williams). Commanding a spaceship takes superb leadership. The vehicle is complex, the team is international, the crew is on their own and the stakes are the very highest – huge financial consequences, and perpetual life or death. Only one Canadian has ever held that command – Colonel Chris Hadfield. Through 25 years in the Royal Canadian Air Force and 21 years with the Canadian Space Agency and NASA, Chris has developed and honed leadership theories and practices that have taken him to the very top. Chris has been an instructor in Crew Resource Management, as well as a teacher in all phases of astronaut/groundcrew team development. He is also a three-time internationally best-selling author, and the leadership ideas in his book An Astronaut’s Guide to Life on Earth are regularly used by students and instructors around the world. An immensely experienced teacher, speaker and leader, Chris will help your team see, learn and remember how to lead more effectively. Commanding a spaceship during an emergency has the highest of stakes: human lives, irreplaceably expensive equipment, and worldwide scrutiny. Spaceflight is an unforgiving business, with industry success riding on every launch and critical event. Colonel Chris Hadfield held multiple leadership and management positions during his 21 years in the astronaut corps, navigating tragedy, delays, program changes, and much more. Using examples from his tremendous career, he illuminates the necessity for both preparation and reaction to complex change. Drawing on his experience from over two decades as an astronaut, Colonel Chris Hadfield shares multiple stories and examples that highlight the fundamental necessity of inspiration as a vital component of success. Colonel Chris Hadfield has worked with countless students and teachers, from pre-school to post-doctoral, for decades. Speaking in schools and at education conferences throughout his 35-year-career as an engineer, pilot, and astronaut, his rare mixture of personal experience, memorable ideas, and a warm, fun, interactive style has influenced a generation. Most recently, his extensive teachings from Earth orbit, recorded on-board the International Space Station, continue to be seen by millions via YouTube. Chris strongly believes in the necessity to give every student the tools and the inspiration to succeed. His face and accomplishments are in Canadian science textbooks, as both a role model and clear example of where STEM education can lead. Using real-world examples from his unique experiences, he enables audiences to see beyond their normal horizons, and helps give them the tools and ideas for personal growth and achievement in learning. Colonel Chris Hadfield shares a selection of stories, images, songs, and ideas in a musical presentation that delights audiences of all ages. Performing songs like his evocative “Beyond the Terra”, which looks away from the land to the skies, Colonel Hadfield ties his presentation together with incredible tales from over the course of his career, including his experience as the ISS commander. Suitable for audiences big, small, and in-between, Chris customizes his performance to meet the needs of all kinds of clients. The millions of us who followed Chris Hadfield’s tweets from space thought we knew what we were looking at when we first saw his photos of Earth. We definitely caught the beauty but we may have missed the full meaning. Now, with a collection of his favorite, never-before-shared images, Hadfield helps us see the big picture: why our planet looks the way it does and why we live where we do. Drawing on his in-depth knowledge of geology, geography and meteorology, he takes us on a planetary photo tour – an idealized orbit of Earth – and explains the mysteries these stunning images reveal. You Are Here opens a singular window on our planet, using remarkable photographs to illuminate the history and the consequences of human settlement, the magnificence (and wit) of never-before-noticed landscapes, and the power of the natural forces shaping our world and the future of our species. The presentation by Chris Hadfield at SickKids was extremely well received by everyone. We had really hoped that his talk would celebrate our trainees and inspire them to think big and get excited about their work and there is no doubt that he accomplished this in spades! His comments about dealing with failure and defining what success means to you really hit home for many people. It’s a week later and people are still talking about it. I would have to say that this was an amazing success and we are very grateful that Chris took the time to come to SickKids and really relate to our audience. ‘Thank you’ seems too meager words for the impact that Colonel Hadfield’s address had on our staff on March 6th. Colonel Hadfield inspired each and every staff member. The way he was able to draw in the audience and intricately weave his experiences into what we are living as an organization was impeccable. There was a palpable buzz around the office on Friday and even today. What a wonderful experience for all of us. Chris — on behalf of Kubota Canada Ltd., its employees and its dealers across the country, we are honoured and thrilled that you were able to be part of Kubota’s 40th Anniversary celebration at our National Dealer Meeting last week in Atlanta. Thanks for your multiple messages of inspiration. Many people mentioned to me that your strategy of “planning to fail” gave them a new way to look at how they might build their business strategies. On a personal note, thanks for tailoring your presentation to our Kubota group and connecting on a familiar level, equipment. As mentioned above, the message was received! Chris’s participation at the reception and his keynote address was exceptional. The event organizers were so impressed with how Chris worked with them and engaged them in conversation. He received a standing ovation from the delegates. The feedback continues to be very positive. Thank Chris again for making this a memorable event. The event went very well last Thursday and the true highlight of the evening was Chris’s speech. He did such a wonderful job of connecting his own personal experiences to C-DAAP and their goal of being able to support dressage athletes and help them realize their dreams. Our annual Safety & Quality Summit includes a Gala Dinner at which he have been privileged to have many well-known and highly entertaining guests; this year, we were honoured to have Chris Hadfield as our special guest and I have to say he excelled all of our expectations, and more. An enthralling story, masterfully delivered with style and humour, and supported with breathtaking images. Chris’s commitment to provide a once in a lifetime opportunity for all of our guests was truly selfless and much appreciated by all who benefited from what was a fantastic evening. The event was outstanding and your help with organizing Chris Hadfield’s speaking engagement was professional and very appreciated. It was the best event we have ever held. Chris and Evan helped to make the event stress-free, being so calm, kind, and friendly, open and attentive to us, our students and guests both before and after the event. They were a pleasure. It goes without saying that Chris’ presentation was beyond wonderful. Inspiring, humorous, insightful, surprising. What a shining example of leadership he is for all of us. We were thrilled to have him in London! Col Hadfield was a smashing success on every level. He was approachable and engaging and went out of his way to accommodate people. The performance was outstanding and we are hearing nothing short of rave reviews. We are ecstatic.